Your iPad uses its own active dictionary to suggest corrections or to complete certain words you are typing. 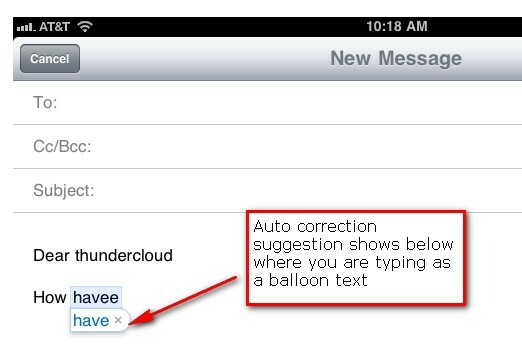 You will see the suggestion in the form of a balloon text below the word (see screenshot at the end of this tip). To accept the suggested word, simply type a space, a punctuation mark, or the return button. To reject the suggestion, simply finish typing the word as you want it, then tap the balloon with the suggestion to dismiss it. If iPad frequently tries to suggest a word for a word you commonly use, iPad will eventually stop suggesting other words and accept your word. You can reset dictionary suggestions by opening settings, and choose General>Reset>Reset Keyboard Dictionary, and it will revert back to its default. Want to turn auto-correction off? Simply go to settings and choose General>Keyboard and turn Auto-correction off. Use the same procedure to turn it back on. I’m a french girl and waiting every week for your newsletter and every day for your infoAve daily. I like it very much. It’s helping me with all your tips and tricks.